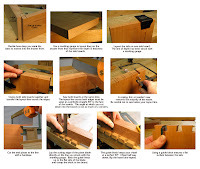 I believe the two most important skills in handcutting dovetails are careful layout and the ability to saw a straight line. 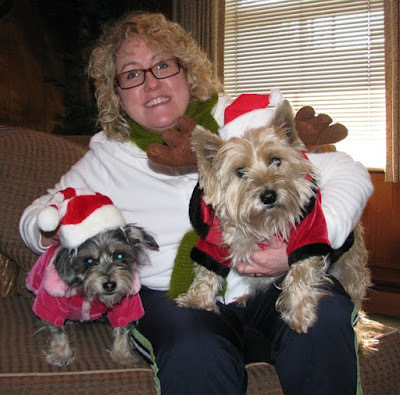 Regarding the feather-ruffling question: Pins or Tails? 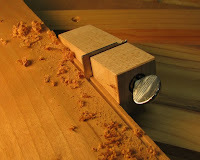 For a box or drawer that will have fat pins, I cut tails first. 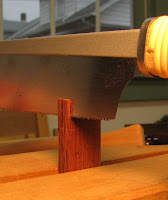 Cutting the tails first allows you to saw the two tail boards at one time. Plus, transferring layout lines from tails to pins is easier than vice versa. 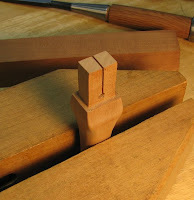 For a delicate project with skinny, English-style dovetails, I cut pins first. With thin pins, it's very difficult (and in some cases, impossible) to transfer layout lines from tails to pins, so cutting pins first makes sense. That being said, I'm cutting tails first for the drawer on the sawbuck table, with through dovetails at the back and half blind at the front. 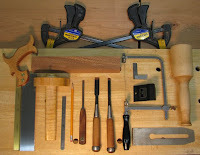 My tool arsenal includes: dovetail saw, jeweler's saw, various chisels, guide block, plane blade, pencil, ruler, dovetail marker, clamps, marking gauge, mallet, and tiny square. I call the technique: Dovetails with Training Wheels. 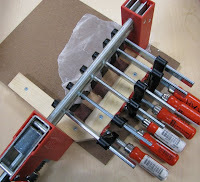 The training wheels are in the form of a guide block that's used to keep the chisel perpendicular to the workpiece. 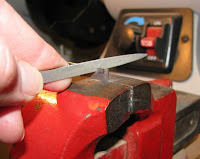 This ensures that the area that's removed between tails & pins will be flat. Some people like to undercut this area so pins and tails seat exactly to the guide lines, but a guide block removes this potential problem. Once I've cut the tails, I use a bevel-edged pencil to transfer the outlines to the adjoining board, but you can also use a marking knife. Take care to make precise marks when you transfer these lines. 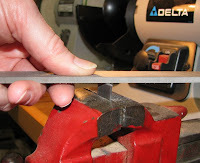 When you saw the waste, cut right to the line (the line will just barely be sawn away when you've finished cutting). The more accurate the layout and cut, the less paring (if any) you'll have to do to fit the boards together. *A friend ac cused me of never posting anything that I've screwed up. So here it is. Because I'm missing a math gene, my boards are not aligned along the top and bottom edges. To transfer the tails' outlines to the front board, I aligned the top and bottom edges as I would with a square project. 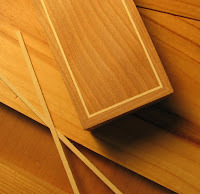 But bevelled sides require that the boards be offset when you transfer your marks. I still don't know the equation to figure out the measurement for the offset, but fortunately the depth doesn't matter in this project, so I can plane the top and bottom edges to match. There's also a gap in the top pin. But it's nothing that a little well-crammed wax can't fix once the project is finished. I am absolutely inundated/swamped/buried/up to my eyeballs with tight-deadlined projects at work...and what better time to take a day off to visit Gettysburg? The Museum Specialist at the Gettysburg National Military Park granted me hours of time to photograph and measure the General Robert E. Lee Medicine Cabinet. 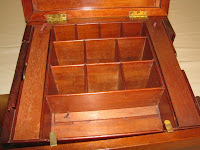 He explained that the cabinet is thought to have belonged to one of Lee's personal physicians, possibly Lafayette Guild, but that a letter which supports this claim and perhaps more details about the cabinet, was lost with the most recent owner, a physician who specialized in tropical deseases, whose widow donated the cabinet to the museum upon his death. Close inspection of the cabinet revealed not just its stunning good looks, but (what I consider to be) its complex and unusual construction. The cubbies in the top section (under the lid) are of two depths— 2 1/8" & 6 5/16"—including a skinny, secret compartment within the shallow front well which drops down an additional 4 3/16", thereby matching the depth of the 6 5/16" compartments. What I find most interesting is the fact that, if the two doors on the front & back and the side panels are rem oved, the box is seemingly held together with 4 stiles and only one rail across the back (where the lid hinges are installed). This isn't like any box construction I've ever seen. 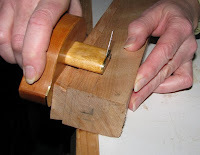 Little pins along the bottom edge of the 4 stiles indicate that they are dovetailed into the base. This holds the box together at the bottom, but what's keeping the top together? 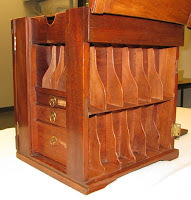 I believe that the long, lidded compartments in the top section are somehow attached (maybe just glued) to the stiles and effectively act as rails. The back walls of the vertical cubbies (on the sides of the cabinet) are probably dadoed into the stiles. 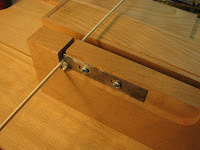 This would help keep the cabinet rigid and provide another glue opportunity. 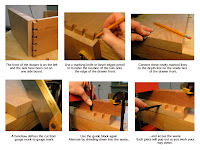 Other details include v-grooves between the dividers in the upper compartments (beneath the lid), 5 dovetailed drawers (the largest one is removable from both sides of the cabinet), and two splined side panels that slide into grooves along the edge of the stiles. 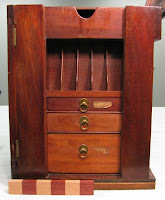 The wood is mahogany, the finish is unkown, and the pulls for three compartment lids look like pieces of shoe lace. All the hardware is brass. I checked Londonderry Brass, but did not find an exact match. The pulls on the Londonderry Brass website are all fancier than the hardware on Lee's medicine cabinet. 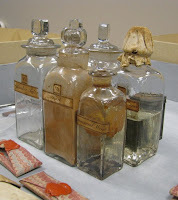 The contents are as interesting as the cabinet itself with some of the original elements inside the glass bottles and other containers still intact. My favorite label was "testimonial wine", which must have been a popular remedy as that particular bottle was empty. *Photos are made possible through the permission of the Gettysburg National Military Park. You cut yourself with a chisel and you’re more concerned about not getting blood on your workpiece than you are about the laceration. You inexplicably find sawdust in your drawers. And I’m not talking about furniture. You can say “crotchwood” with a straight face. It has caused you great pain to pay money for furniture that was poorly made. You have dropped to your knees and looked beneath a table in a museum, a gallery, an historic home, or a friend’s house. 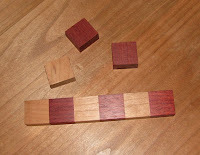 You know the difference between a tendon and a tenon but you sometimes use the words interchangeably. 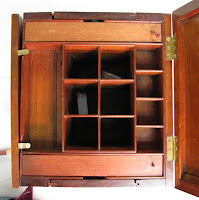 You cannot resist the temptation to lift the lid on a wooden box. You secretly think “measuring tape” suspenders are pretty cool. You can talk to your partner/spouse/significant other for HOURS about woodworking despite the glazed over look in his/her eyes. 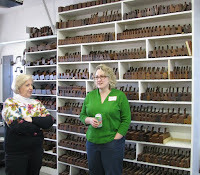 You have wondered what it would be like to own a woodworking business. You can spend an entire day in your shop, accomplish little if anything, and thoroughly enjoy it. You know exactly where everything is in your shop....except for a pencil. You have built more projects in your head than in actuality. Your spouse/partner/loved ones/pets know not to bother you, and sometimes choose to run for cover, when you are gluing up a project. Even if you don’t work with it, you love the smell of fresh cut pine. You either love or hate the smell of fresh cut walnut. There is no in-between. You remove more splinters from your hands in a month than most people do in a lifetime. You can correctly pronounce Padauk and Lignum Vitae. I'm building a project in my workshop this morning (surrounded by a sea of woodworking tools) when my partner walks in and asks, "Where are your tools?" (Translation: when a person who is not a woodworker asks where he/she can find your "tools", he/she means they need a wrench, hammer, pliers, or drill). I've always liked Stephen Shepherd's wooden reference ruler he places in his photographs so that readers have a sense of scale. 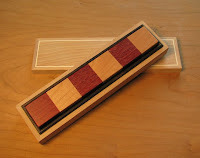 So I decided to make my own out of cherry and bloodwood. You can cut the 1" pieces by hand, but I used a crosscut sled on my table saw* along with some scrap pieces—one used as a stop block and one to protect my fingers. 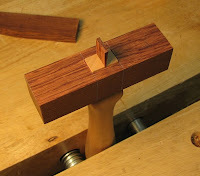 The jig I had built to make some picture frames worked well at keeping the pieces square during clamping. 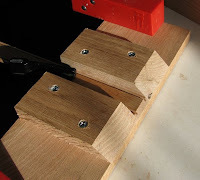 A sheet of wax paper between the jig and the workpieces kept the two from being glued together. The ruler is thick enough to stand vertically without toppling over but thin enough to be positioned relatively close to the object I'm shooting. After glue up, I handplaned the ruler smooth using my favorite jig. Cherry and bloodwood when first planed are contrasting in color, but over time, if left in sunlight, will both turn a dark reddish brown. 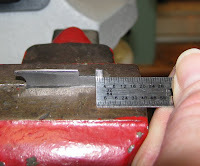 That diminishes the effectiveness of the ruler if you can't see the line of demarcation between each inch. So, I plan to build a special little box for it. I just hope my metal rulers don't get jealous. *Be sure to use the blade guards and safety features that come with your power equipment. 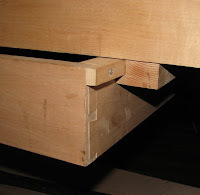 The sawbuck table I'm reproducing has a drawer with runners that slide within dadoes that are cut into the sliding dovetailed stretchers. I wasn't able to tell from the photo of the original sawbuck how the runners were applied to sides of the drawer and I wanted to try to be as true to the original as possible. Roy Underhill brought his workbench to the WIA Conference and as luck would have it, a little drawer was to be found beneath the work surface like the one on the sawbuck table (Roy's bench, top photo). I figure that Roy's drawer runners are historically accurate, so I'll make mine the same. 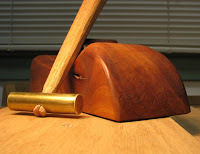 I laid out the dadoes with a marking gauge and had planned to cut them with a router plane as I've done before, but as a seeker of variety, I wanted another option. Then I remembered a tool I had bought at a farm auction for $25 about 15 years ago that I had never used. When I bought it I had no idea how to fix it up or sharpen the blades, but it was a cool-looking tool at a cheap price so it followed me home. And lucky for me the guys at the auction were more interested in plows than in plow planes. 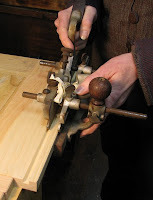 I found out later that it's a Sargent Combination Plane—a cheaper version of the Stanley Combination Plane. 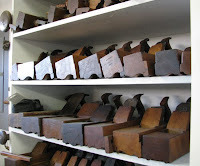 There are 21 cutters with different profiles, including ones used to cut dadoes. 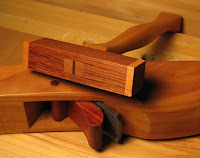 For more information on combination planes, check out the Cornish Workshop, here and here. The plane and cutters need to be cleaned of dirt and superficial rust, but I took it for a test run nonetheless and it worked very well. 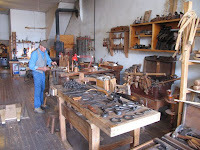 Some of the cutters look as though they've never been used. 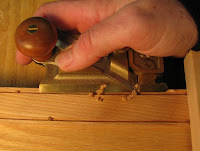 *I wonder if I wish for a Lie-Nielsen jointer plane I'll suddenly remember that I have one! I played third base in fastpitch softball for 26 years. During that time, I snagged line drives that were travelling so fast, bystanders were looking in the outfield to see where the ball had landed, not realizing it had been caught. I hit pitches that were screaming toward me at 85 mph from only 40 feet away. I dove for grounders, slid headfirst into bases, and was bloody most every game. People thought I was fearless. And then came the game when both of our catchers were sick. I was asked to fill in. No prob, right? Wrong. I gained new respect for catchers that day. When a batter swings a lethal weapon in front of your face as a ball the size of a grapefruit is careening toward your head, you'd better have nerves of steel. Or be wearing adult diapers. But because there were onlookers and because I would never let my team down, I hun g in there and didn't embarrass myself, but I sure was glad when the game was over. As a newbie turner with very few hours of lathework under my belt, I had never had a mishap.....until a few days ago. The gouge I was using snagged the wood and the workpiece snapped in two and came flying toward my face (I was wearing a mask). It missed, but my nerves were shot. I'm back at the lathe today but pretty jumpy. What should take a half an hour to turn is taking hours. The lathe has made a girl out of me. Maybe if I had onlookers or better yet, catcher's equipment, I'd at least be able to fake fearlessness. Or maybe I should just buy some Depends. Here are some photos of Roy Underhill (man of a thousand expressions) on set in the Woodwright's Shop and on a roadtrip to Berea, where he visited Don Weber and Warren May. In the first few images, the men with Roy, Marcus Hansen and Ed Wright, both of whom are finish carpenters at Colonial Williamsburg, are using a fancy ellipse machine. To see one in use, check out Stephen Shepherds's video and read about it here. In mid-September, Roy visited Don Weber's shop where he got a first hand look at Don's reproduction 12th c. Viking chest (at left). You can read more about it on Mitch Roberson's blog. Warren' s May's shop is the last photo, where Roy is examining Warren's dulcimers. 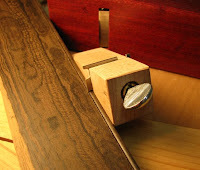 Photos are presented with kind permission from the Woodwright's Shop's cameraman & photographer, Mike Oniffrey.